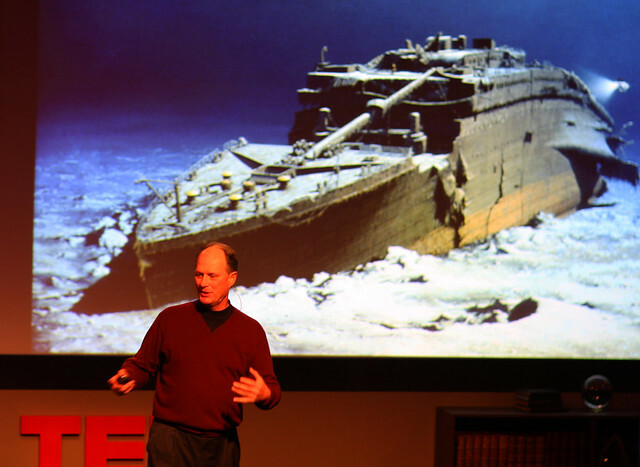 Legendary underwater explorer Robert Ballard has added two more shipwrecks to his already incredible list of discoveries (RMS Titanic, Bismarck, USS Yorktown and John F. Kennedy’s PT 109). Ballard and his team spent two weeks off the Cypriot coast exploring the Erastosthenes Seamount, a 120km by 80km undersea mountain that was previously above water. The expedition’s chief goal was to survey the seamount’s geology through the use of submersibles and high definition cameras. Ballard plans to return in several weeks after the Nautilus is equipped with a new sonar system that will allow him and his team to map the seamount. Previously the seamount was believed to contain only limestone, but the expedition located a formation of volcanic rock that doesn’t fit the area’s geologic profile. Additionally, the team found a curious methane source on the formation which requires further investigation. It was in the process of completing their geologic mapping that the team discovered the two wrecks. One ship is believed to have sunk 2,300 to 2,500 years ago and carried cargoes between Greece and Cyprus. Among the artifacts photographed at the scene are a variety of ceramics, two anchors, a possible bun ingot and several other unidentified objects. The second ship appears to be an Ottoman war galley and an 18th century flintlock pistol and black rum bottles were located amongst the wreckage. One question left unanswered by the expedition is the speculation that Ballard’s team was searching for a WWII-era wreck containing a gold cargo. There exists little grounds for such speculation, though, as Ballard is known for not seeking to directly profit from his underseas exploration. Prior to this month’s expedition, Ballard helped Turkey locate the two Turkish pilots lost when their F-4 crashed under mysterious circumstances near the Syrian border.